Big data, for instance, can be very helpful, but it only provides a broad overview of a large customer demographic and doesn’t provide the ability to drill down into individual preferences. Likewise, other forms of customer research—like looking at online customer reviews and conducting mail-based surveys—take time and don’t always provide helpful information. An effective way to bring your R&D team up to speed is to have a member sit in on your online product webinars. Doing so will help them gain a wealth of invaluable feedback in the form of questions and comments. After all, most webinars will offer a specific question-and-answer section at the end that can be used to interact with customers. Research and development representatives can either sit in silently and take notes, or interact directly with customers. And in some cases, individual customers can be specifically targeted up for follow up questions in order to gain a better reading of what he or she may be looking for in the product. Consider it an open, pressure-free invitation to connect with customers in real-time and exchange meaningful dialogue about your company’s offerings. There is perhaps no better window for doing this, short of the brief window of opportunity you may get on a customer service or telemarketing call. Remember: The more in tune with your customers your research and development team is, the easier time you will have creating the products and services they can’t live without. 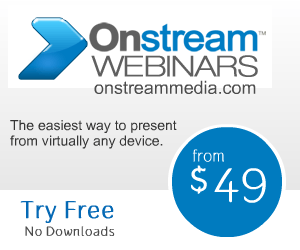 Click here for more information about how Onstream Media’s webinar services can help your research and development team understand its customers better.